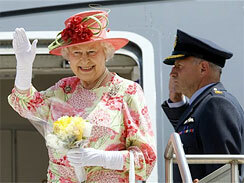 UNITED NATIONS, July 6 -- The UN was all aflutter Tuesday for the arrival of Queen Elizabeth II. More than a half an hour early in the General Assembly, Ambassadors from Pakistan, Chad and Sri Lanka, among others, assembled to hear her Highness. The Queen was set to stop and view the tattered flag from the Canal Hotel in Baghdad, where UN staff were killed by a truck bomb. 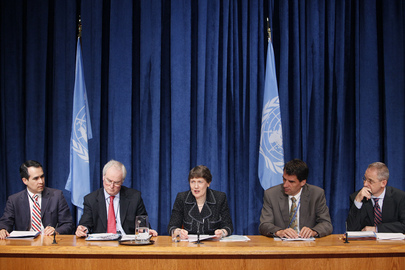 At the noon briefing before the Queen's arrival, Inner City Press asked the UN's Associate Spokesman Farhan Haq to confirm or deny what Staff Union officials say, that the families of national staff killed in the bombing have yet to be compensated. Haq said that he would check. The Queen, it was predicted, would call for world peace. UNITED NATIONS, June 28 -- The new UK government has cut all aid to China and Russia, while contrasting the entrepreneurial spirit of Somalis with the lack of such drive in Ethiopia. 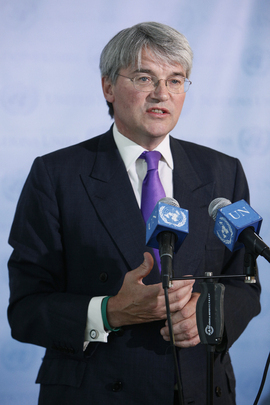 This Inner City Press gleaned in ten minutes of questioning of David Cameron's minister for International Development Andrew Mitchell on Monday, on topic ranging from North Korea to Gaza to corruption. Video here, from Minute 4:33. Inner City Press began by asking about Mitchell's review of the UK's existing aid programs, to China and also the UN Development Program, which maintains programs in China, North Korea and Myanmar. Mitchell maintained that the “best” approach is budget support to governments, but only if you can trust them. He said reviews of “multilateral agencies” have begun. One wonders: if the UK has cut aid to China, will it cut aid to UNDP which spend in China? Or will it earmark it aid, to only some countries? Mitchell went out of his way to praise the governments of Ghana and Rwanda. One wonders if the latter doesn't further the UK's move to “take” Rwanda away from the Francophonie. Because the UK's own BBC over the weekend reported how Hutu refugees in Uganda are afraid to go home, based on how they are treated -- with UK aid funds? On camera, Inner City Press finished with a question about the UN “Gender Entity,” and the controversy about Syria's language on women under occupation. Mitchell jumped right in, saying that Gaza is troubling and the lifting of restrictions is heartening. Our conclusion is, he said, that conflict is what mires people in poverty. A country with entrepreneurs is not poor. Inner City Press asked about the Ogaden region. “I have a large Ogaden constituency near me,” Mitchel said. Then why did he so fulsomely praise the sinews of Meles Zenawi's government? Perhaps we'll get an answer. Mitchell's candor was, to paraphrase something he said, a breath of fresh air.